The economy started to improve in the late 1930s. 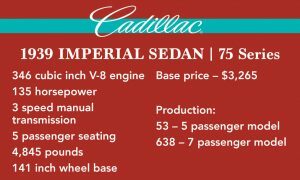 As a result, Cadillac updated their automobiles. They redesigned the dashboard and added an optional vacuum-operated radio antennae. They updated the front end with a prow-shaped, vertical radiator flanked by grilles between the fenders and repositioned the head lamps. When planning a wedding, put some thought into your ride to and from the ceremony. Take a look at these classic cars that could represent your entrance as betrothed or exit in holy matrimony. Vintage cars give that A-list look right out of a classic movie and can create red-carpet moments. Some of these dream cars can include the top of the line Rolls Royce, Aston Martin and others, but many classic cars can fit the bill. Contact your local car club or find some car shows months in advance and see what may be available to accentuate your wedding day. Make sure you know what you’re literally getting into, however. Ron and Betsy Thomas, a pair of classic car collectors out of Zanesville, suggest those interested in a stylish vintage vehicle to whisk them away first do their due diligence. Betsy added that some classic car owners may be leery of letting high heels into their vehicles as well. Nonetheless, few spectacles lend themselves to such an entrance or departure like that of a vintage car getting a newly wed couple on the road to happiness, so, if you’re interested, check with your local car club or go online and see about how to park your own ride for your wedding day.